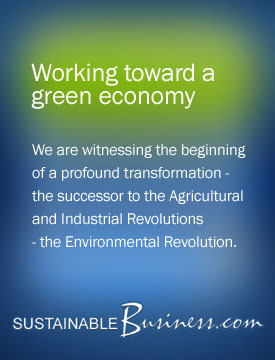 SustainableBusiness.com has a global reputation as the center for environment and business on the Internet, providing news, resources, insight, and inspiration to accelerate momentum toward a green economy. We are the Internet community for businesses that integrate economic, and social and environmental concerns into their core strategy. In short, we help green businesses grow! To us, sustainable businesses are companies that unabashedly embrace the goal of enhancing life on earth as an integral part of their business strategy. These companies show exceptional leadership by their explicit commitment – and the significant resources they allocate to back it up – to address the ecological crisis as it relates to their industry. Sustainable businesses offer products and services that fulfill society’s needs while contributing to the well-being of all earth’s inhabitants. We are witnessing the beginning of a profound transformation – the successor to the Agricultural and Industrial Revolutions – the Environmental Revolution. It seems to take a crisis for human beings to get serious about doing things differently. That is the silver lining to the grave environmental problems humankind is about to experience – out of the impending crisis will come true change. The transition to a green (clean) economy is underway. That’s what we believe at SustainableBusiness.com. The fundamental change will be a re-ordering of priorities. I believe that “Quality of Life” – the stuff that makes us human – will finally supersede profits (for business) and consumption (for “consumers”) as the number one position. In the next stage of our evolution, humankind will turn its attention to clean water, air, trees, biodiversity, and people as the highest priorities. Business plays a pivotal role. Many corporations have revenues and assets higher than the gross national product of many countries, and are as powerful, if not more so, than government. The role of business will change from thoughtless Industrial Age producer of endless products and profits for an unsustainably expanding population and economy to Environmental Age trader of services and products necessary to maintain a steady state balance for life on earth. Completely new kinds of businesses are being spawned to solve the Industrial Age problems. Now that one of four people on earth doesn’t have clean water to drink, a water recycling industry is emerging. Just as global warming is gathers steam “CO2 cleaning” companies are rising to the opportunity. Legions of new types of companies will be required to give birth to the coming hydrogen economy. Industrial Age companies will re-invent themselves to take advantage of the infinite business potential of providing services and products that enhance life, rather than destroy it. Oil companies are beginning to see profits in selling renewable energy; car companies are getting closer to providing clean transportation. Steel, often thought of as the symbol of the Industrial Revolution, now carries a recycling symbol. More than half the steel produced today is made from scrap. Paper mills are moving from the forest to the cities, as they hone in on the source of abundant feedstock – scrap paper. Many thousands of small businesses are leading the way, and the list of corporate visionaries is growing rapidly too, paving the way for the rest to follow. The Dow Jones Sustainability Index and the FTSE Index are just two of the emerging financial indexes that cover sustainable companies worldwide. There are sustainability leaders in every industry: Interface and Collins & Aikman in floor covering, BP & Shell in energy, HOK in architecture and design, Herman Miller in office furniture, Scandic in the hospitality industry, IKEA in retail, Xerox in office equipment, Philips in Electronics, to name a few. In fact, the sustainable sector of most industries is where the action is whether it’s in agriculture & organic products, design & construction, renewable energy and on and on. Every person and organization must decide the path they will take to bring this vision to reality. At SustainableBusiness.com, we serve the businesses that are ready to make this vision a reality now. We are the Internet community for businesses that integrate economic, and social and environmental concerns into their core strategy. In short, we help green business grow. We use the Internet to “grease the wheels” – to accelerate the spread of sustainable business practices by increasing market penetration of sustainable products, services, and the companies that produce them. SustainableBusiness.com covers the field as a whole, bringing together businesses from such diverse industries as renewable energy, organic products, social investing, green building and construction, and re-manufacturing. By providing businesspeople direct access to the information and tools they need, meaningful employment and resources for sustainable business development, we are helping to shift human and material resources toward a restorative economy. You can learn it all and keep up with the pulse of the industry through SustainableBusiness.com. Our acclaimed on-line trade magazine, reports on the latest developments and trends across all sustainable business sectors. Our very popular job service that connects people with business skills with environmentally conscious nonprofits and businesses. A monthly newsletter that guides investors and advisors toward sustainable investments. Our networking service that helps young green companies find the financing and partners they need to grow. Our compilation of the most useful web sites, databases and resources for sustainable business. Add your voice and contribute to Sustainable Business. Email me with your comments and ideas. Write articles, network with the people who post Business Opportunities and post your Green Job listings. Rona Fried, PhD, is the President of SustainableBusiness.com, an amazing resource.